This was my first time taking pics of Illuminations from a absolutely picture perfect location in a seated position, adult beverage at my side with an unobstructed view! Best of all, no one was jostling my tripod or shoving for a better view. Touring the World Showcase countries in the afternoon, having dinner in one of the countries then topping off the evening with Illuminations is my idea of a perfect plan. We may not touch all 11 countries every time but you can always find me watching Illuminations in Epcot at 9pm. There are several spots I enjoy viewing it from. On this particular night we had just finished a fabulous dinner on the The Rose & Crown upper balcony (review coming soon) when the fireworks started. Our dinner was timed perfectly as our server lifted the last plate the show started. There is exactly 30 minutes between the time the music starts and the show begins. It was a calm night without wind and in my opinion the best viewing area to see Illuminations. Our server explained that on a windy night the ashes will fly on the wind in the direction of the Rose & Crown and Canada. I was aware of it because it had happened to us in the past but I had no idea that there are metal roofs on a few of the buildings in the UK and Canada to protect them form ashes. It was a magical memorable night filled with pixie dust we'll always remember. 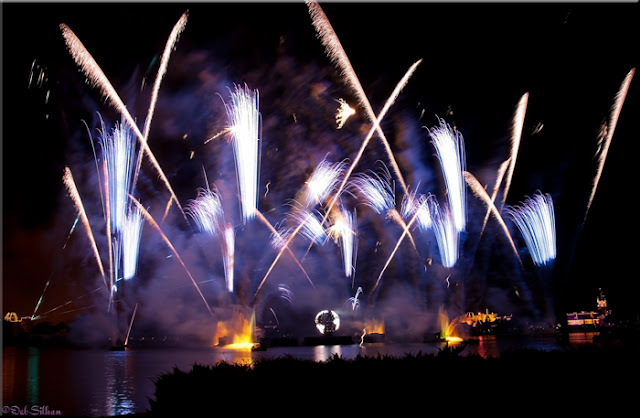 What's your favorite area to view Illuminations? I'm so glad you didn't let it spoil your moment:)You turned it into an even more memorable moment! What a beautiful spot to have a dessert party. That must've been very special!